Being a leading Vietnam travel company, we have contracts with all luxury Saigon hotels or Ho Chi Minh hotels. Therefore, on booking hotels in Saigon with us, you will get the best price including 10% VAT and 5% service charges and International buffet breakfast. Pay only one time on booking Saigon hotel( room price for 2persons). The location: 2 Lam Son Square, District 1. The hotel Features: Designed more like a contemporary Vietnamese residence rather than a hotel. 252 French colonial designed rooms and suites with marble-tiled bathrooms - separate bath and wet area featuring a rain shower and a therapeutic handheld shower. The location:88 Dong Khoi Street, District 1. The hotel Features: In the center of the vibrant business and entertainment district of the famous Dong Khoi Street. Close to Opera House and Reunification Palace, Ben Thanh markets....on Dong Khoi St. The hotel Features: 349 rooms and suites with the latest amenities including IDD telephone, voice mail......on 21 floors. 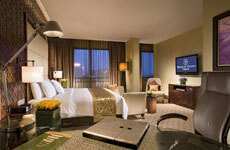 Over half of these elegantly styled, spacious rooms offer panoramic views of Saigon River. The location:17 Le Duan Boulevard Dist 1. The hotel Features: In the heart of the city, home to the US and French Consulates and a few minute walking to the Reunification Palace and the majestic Notre Dame Cathedral. The hotel Features: Vietnam's largest 14 story hotel offers 542 guest rooms including 28 suites and 32 business units, equipped with a full array of first class amenities. The hotel Features: Built in modern colonial style and just 10 minute drive to international airport and 20 minute drive to Ho Chi Minh city centre. The location:18 An Duong Vuong Street, District 5. The hotel Features: Situated in the heart of China Town, 30 minutes from the airport and 10 minutes to the city center. 10 minute walk to An Dong and Cho Lon markets. Passion for Ultimate Luxury is our goal of working. To make unforgettable Saigon trips, we always get our tourists' feedback when they get home. Therefore, our recommended luxury and deluxe Ho Chi Minh hotels and resorts may change with the time.